have i got a treat for you today or have i got a treat for you today?! here we are frolicking in the ocean with our babies in florida. our babies are not babies anymore and you totally cannot even see them due to hair situation i have going on. she is my first blog friend turned IRL friend. IRL = in real life, for those who are not in the abbreviations bloggers use club. i love her a whole lot and the fact that she supplies beautiful art to decorate my home with doesn't hurt much either. i believe the only room in our house without a print or painting in it is the bathroom. which is about to change right… now. BOOM. i could ramble all day about lindsay and pen and paint but really, buy her stuff. use that coupon code. you will fall in LOVE with your new art. Hi, I'm Lindsay. I'm a busy mama of two silly little boys. I am a southern girl with a loud laugh, a sensitive heart and a little bit of sarcasm on the side. I like to draw and paint, a lot. After taking a bit of a break from the blogging and handmade world, at the beginning of 2012 to refocus on myself and my family, I picked up a sketchbook and an ink pen and started drawing. The more I drew, the more ideas I developed, and I saw the need to make a change in the name of my blog and shop of three years from Paint Me a Picture, to Pen and Paint. Now I am back gathering inspiration from the blogging and handmade community, creating happy prints. Every now and then I still love picking up my paintbrush and creating a fun piece of art. you are also the jam. love the be still and know print!! follow lindsay on the tweet machine. I like the "trust in the Lord will all your heart" print! ummm do I have to pick ONE item for my favorite?! That's so difficult! I guuuuessss if I had to choose, it would be the pink & green "Be still & know." Love that reminder and the design is just SO SO beautiful. 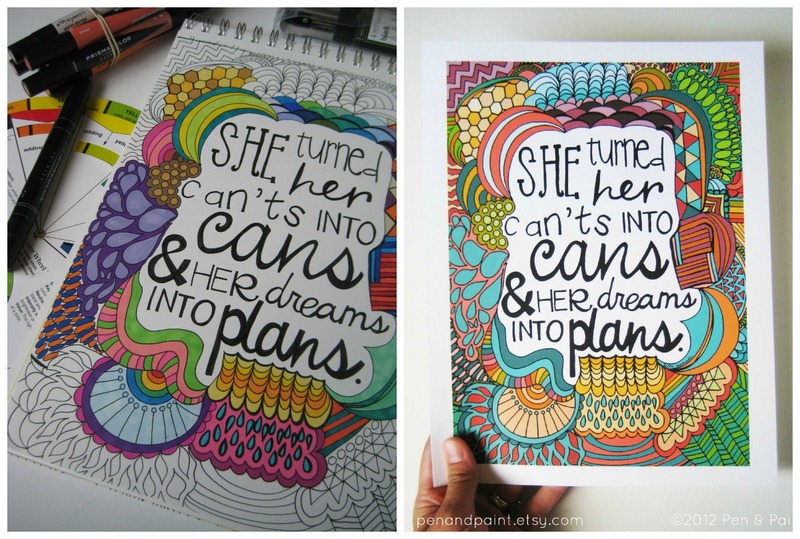 My favorite print is the "She Turned Her Dreams Into Plans" print. LOVE. oh geez i LOVE her stuff! i like pen & paint on facebook! i've perused her shop several times before and i must say i'm in love with it all. i love all the pretty colors. in this very moment though i like the one up above "be still & know." i need that reminder a lot! that nail polish print is soo cute! liked pen & paints on FB!! Lindsay is crazy talented. Love her art. i want a be still and know! 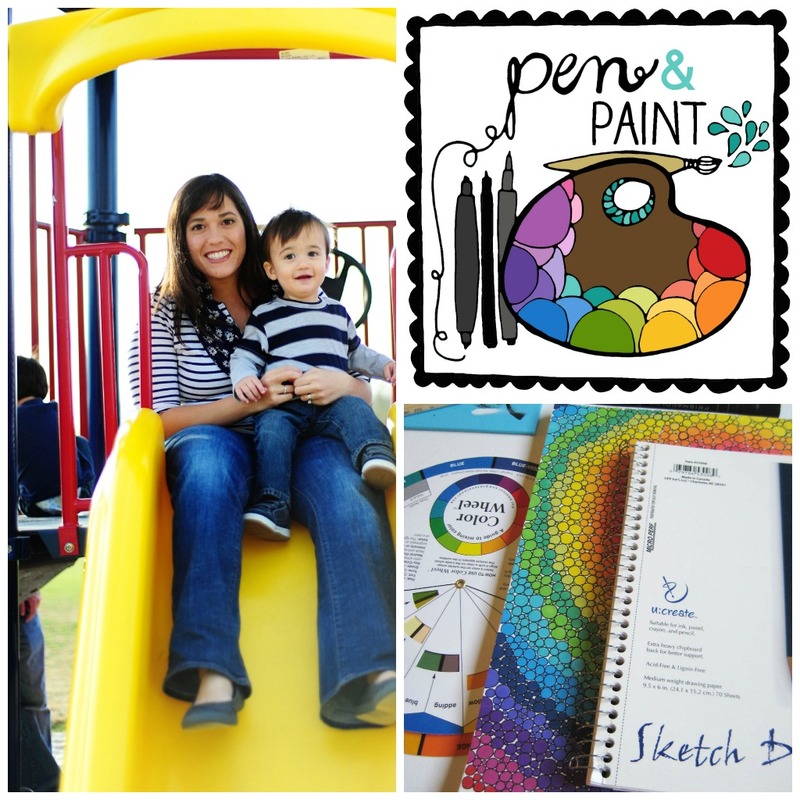 Tweeted: @danielleburkleo has a @penandpaints giveaway going on. Want to win. You should too. and, lastly, i retweeted your tweet! I adore the "do small things..." print, in teal. i now follow her fantastic blog!! Aaaaaand i just liked her shop on fbool! Im spent. 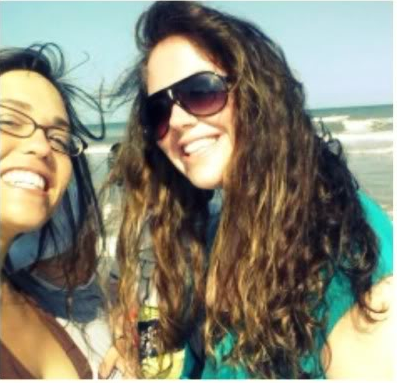 Love her work and Danielle you seriously have big hair in that pic- lol! Love the nail polish print!!! Love the nail polish print!! I would love to get the state print for my husband. He loves our state. i would love the be still and know print. i follow your blog. hollllla. following you on twitter. feel special. i don't follow just anyone. I like the happiness is handmade prints. Lindsay is AMAZING. So jealous that you've met her IRL. ;) & I would love to own even more of her art!! I think my next piece should be something with colorful coffee cups...love them! I like pen and paint on FB. I follow Linsday on twitter. Thanks for introducing me to such a fun, colorful shop! ooh, favorite in her shop is "pretty is as pretty does" i love that one the most. So fun! I'd love to win. i like Pen & Paint on FB! liked her fb page, too. Liked pen and paint on FB! Tweeted about this :) thank you once again! love it all. want it all. I already follow your blog. WOOT WOOT! I am not a pen and paint FB liker! thanks for the new "print" love. oh and my fav print is the "choose joy"
Oh my gosh, I love love LOVE her work!! Such a great giveaway! My fave item is the "be still and know." Love it. I liked Pen & Paint on Facebook! Aaaand I'm now following her blog! wow! i love her work! her work is A-MAZING! I would put it in every room in our house. ok, my favorite piece from her shop is....ok, i have to pick two. the Be Still & Know or the one with the 6 coffee cups. LOVE! Ooh I just discovered her and I LOVE her prints. I asked for one for my birthday, too :) She's awesome! My favorite item is the State Love print. But I also really like the quote: "do small things with great love"
I'd love a custom state print! I would love to win one of those prints! She is so talented! I liked pen and paint on facebook! My favorite print is the navy and coral Be Still and Know. Love it! Thanks for the chances to win! Lovely giveaway she is awesome! Love the nail polish print! I love the Ohana print and the "she turned her can'ts into cans..." print. love the coffee cup prints! I follow Lindsay on twitter! I love all of her prints!! My favorite would have to be either the choose smiles, love and life print or the tea cups print!! She is so talented!! Love all of her art! I follow all ya tweets. I liked Pen & Paint on fb. I can't choose a favorite. I love them all. The colors are amazing! 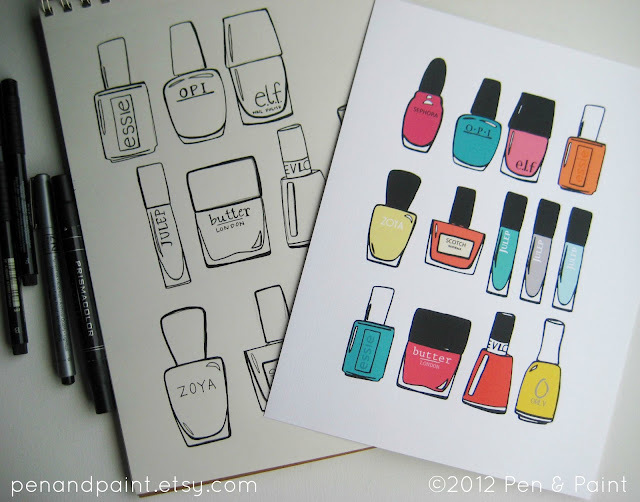 The nail polish print is my favorite! such inspirational pieces! I follow you mama! I now follow Pen & paint's blog too! I love the state prints as well as the yellow flowers scripture print as well! And I liked Pen and Paint on FB, too! my favorite print is the trust in the lord with all your heart one! so cute! and here's my freebie comment. i need to win mmmkay?! Great giveaway. She is really talented! Love lindsay! She is so so talented and super sweet in real life!! I love that be still print - one of my favourite verses! Also, I follow your blog - love it!! Thanks for the giveaway chance - and for sharing this wonderful artist with us! how do you even decide on what you want? her state pictures, the camera print, "be still"... i could spend a LOT of money there!!! i also started following her blog! I follow Lindsay on Twitter. I like Pen & Paints on Facebook too. love love love everything she does!